In what is clearly a desperate plea for attention, Gomes has decided to destroy the very bedrock of this Podcast/Blog, The Ultimate Guide to Life After College, by going back to College. He is holding a party to start the newest chapter of his pathetic life. 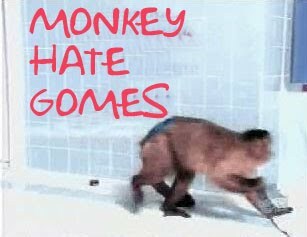 Ironically, he is requesting that his much needed emotional support come from regular listeners of the Podcast titled "Monkey Hate Gomes". Needless to say, his return to the education system appears ever necessary. Congrads again good sir. Wish I could make it!